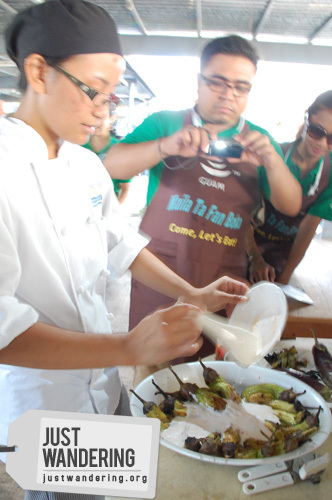 Chamorro cuisine is pretty basic and centers on key ingredients: meat, coconut and chilies. If you’re to attend a party in a Chamorro’s house, you’ll mostly likely to find the dining table heaving with platters of meat dishes, dishes with grated coconut or coconut milk, and they would be spicy (for some Chamorros, the spicier, the better). The mainstay in any table would be the kelaguen. This is the usually the first thing that comes to mind when one is asked about local Guam cuisine. 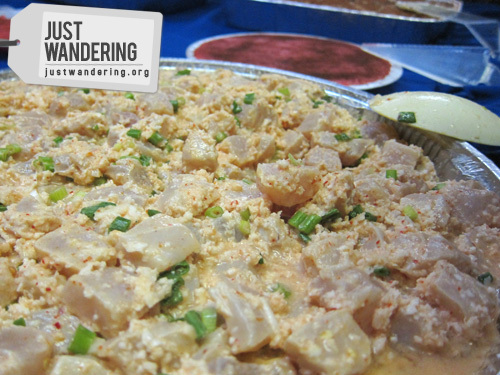 Kelaguen is similar to our kilawin or the ceviche, which shows Guam’s influences from the Philippines and its role in the Manila-Acapulco Galleon trade. While our kinilaw is usually made with fish, kelaguen can be made with fish, shrimp, chicken, beef, venison and even Spam. Yes, Spam! Making kelaguen is very easy: chop up your meat of choice (cubes for fish, beef and venison; finely chopped for chicken and spam; coarsely chopped for shrimp), then combine it in a bowl with finely chopped spring onions, freshly grated coconut, finely chopped chilies and your citrus of choice (lemon, lime or calamansi). Adjust the amount of chili and citrus to your tastes, making sure that one doesn’t overpower the other. Variants sometimes include coconut milk and ripe mangoes. Kelaguen can be enjoyed with flour or corn tortillas (or titiyas, as they say in Chamorro) or even white or red rice. Red rice is made by using achiote (atsuete) seeds to color the water used for cooking the rice. Red rice is usually only served during special occasions. Chamorros love their meat. 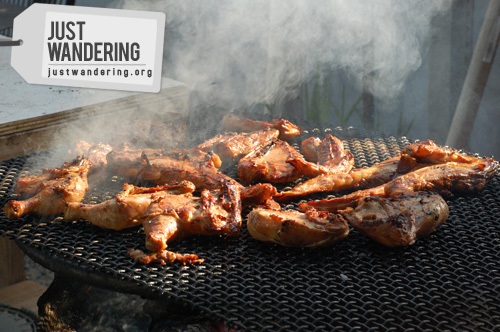 In all the meals we’ve had, there’s no shortage of grilled or roasted meat. There were always huge platters of ribs and chicken, and if it’s a really special occasion, you’ll even see a hotnon babui or lechon as we call it in Filipino. Like other tropical countries, Guam has its fair share of coconuts, so it’s only natural that it’s part of their cuisine. They have dishes made with coconut milk, much like we have our ginataan in the Philippines. One superb example was the lechen biringhenas (barbecued eggplant with coconut milk) that was taught to us at Senator Muña-Barnes’ family compound. It’s fairly straightforward: grill and peel eggplants then arrange in a platter. In a bowl, mix coconut milk, chopped chili, salt and pepper (amount vary according to your taste), then pour over eggplant. Voila! It’s so simple, no? Thanks to Guam’s close ties with the Filipinos (Pinoys have been settling in Guam since the time of the Spanish colonization of both countries), it’s not surprising to see Pinoy favorites in the dinner table. 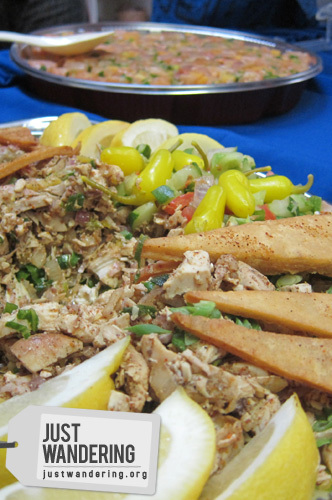 Pancit bihon, a mainstay in Filipino parties, is also present in the Chamorro’s party spread. 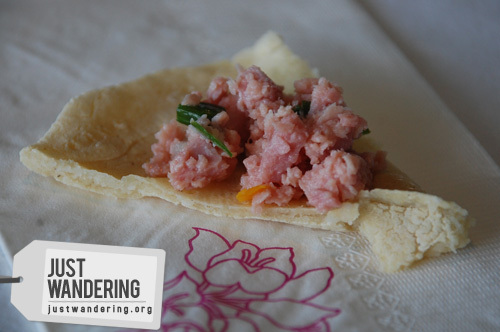 The lumpiang shanghai can also be spotted, as well as the local version of the adobo — estufao. 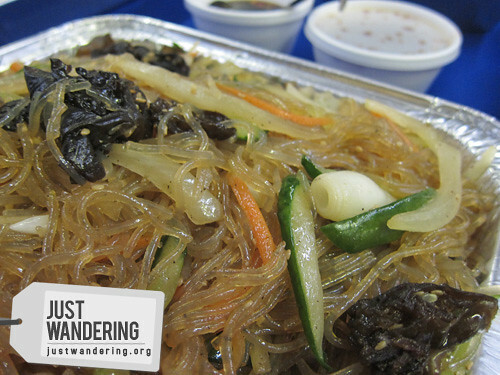 One might start to think that the food in Guam is not that exciting, specially if you’re coming from the Philippines. The way I see it though, it’s not exactly the same food. The base is the same, but they have given their own twist in their versions that makes you appreciate both Filipino and Chamorro cuisine. That said, I’m off to make me some kelaguen. Still sounds pretty interesting to me! Meat + coconut = yum. You have to try kelaguen Chris! Mouthwatering post. I’ll show this post to my “Chamorro Uncle” who lives in Saipan. Haven’t made it to CNMI yet but hopefully someday with more time and money. very similar to philippine cuisine, but yes, not really. the ceviche from my hometown also includes carabao meat aside from fish. and that grilled eggplant, i must try! yum. there’s something about grilled eggplants that i intensely like.